Today while Leia took her nap I got started weaving the overshot rug. 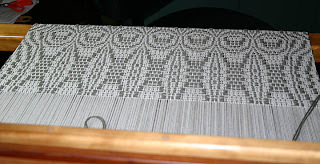 I'd put the warp on last week (here), then got distracted putting the Guild books online. 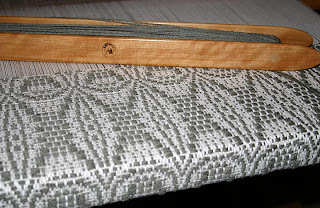 The project is from the March/April 2007 edition of Handwoven, where it was done in the more traditional blue and natural. The draft is 'Orange Peel' from Josephine Estes' 'Miniature Patterns for Hand Weaving' published in 1956. I had planned to do this with red rug wool, but the more I looked at the cone, the less sure I was that I'd have enough. The green is more subtle but I love how it looks. I've woven three of the ten repeats; tomorrow we're driving to San Diego for a wedding so I won't get back to weaving until Monday. 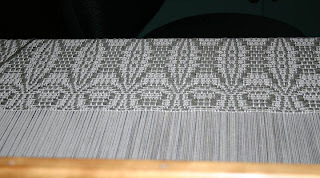 Once I get this off the loom, I'm seriously thinking of tying on another warp and weaving another rug. Hey Rach - want a rug for your house?